If you read my blog regularly, you would know that few days back I had reviewed Biotique Tan Removal Scrub that is really effective if you are having suffering from tanning! I also got Biotique Bio Nectar Flawless Skin Lotion but I was very skeptical to try it as previously I had tried their Bio Morning Nectar Sunscreen which did not suit my oily, combination, acne prone skin at all! Read on to know my thoughts on Biotique Bio Morning Nectar Flawless Skin Lotion*. It is priced at Rs 199 for 120 ml and you can BUY ONLINE HERE at an offer price. Biotique Bio Morning Nectar Flawless Skin Lotion comes in a Biotique patent green and white white plastic bottle with a screw top lid. The cardboard packaging shows all the information about the product and brand! Previously Biotique lotions used to come with mouth open but now they have improved and this lotion comes with a stopper. The stopper helps in controlling the amount of product. The formula of the lotion is soft with slightly thick consistency. The scent is mild and refreshing! I used it on my oily, combination skin but it feels heavy and made my skin oily within few hours so it a big NO for me. I then thought of using it as body lotion as the consistency is just right for a body lotion. It works like a charm as body lotion. I applied it onto my skin post shower and I love how soft, smooth and moisturized it feels. I have normal body skin type and it gets absorbed instantly without leaving a residue behind. I am using it for the last 2 weeks and have not faced any skin irritations! It does not feel heavy even in this hot weather. I also use it as hand cream before hitting the bed. It makes my hands super soft and nourished! It also helps in lightening the skin as it does remove tan and dullness from the skin! - Lovely and refreshing smell. - Does not feel heavy when used as body lotion. 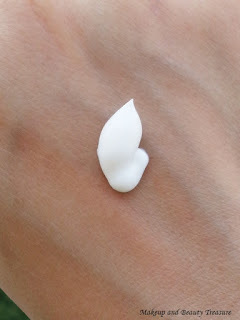 - Great face lotion for people with dry skin! - Skin feels soft, supple and nourished! - No comedogenic ingredients so safe for acne prone skin! - Feels heavy and oily on oily, combination skin! Biotique Bio Morning Nectar Flawless Skin Lotion is a lotion to keep your skin soft, smooth and supple. I loved using it as body lotion. It smells refreshing and gets absorbed almost instantly. It does not feel heavy on my skin and hydrates it well. I would definitely recommend it to dry skinned people to use it as face lotion. If you have skin like me then use it as body lotion! - Apply it as body lotion post shower. - Use a sunscreen if you are planning to stay under the sun for a long time! - Use it as hand cream to get that soft and super smooth hands! Have you tried Biotique Bio Morning Nectar Flawless Skin Lotion? What is your favorite product from Biotique? Don't buy this if you have oily skin!!! This sounds good. But I have oily skin, so I'll have to wait till winter to try this. It's not for oily skin Sangeeta!!! I luv the eye cream they offer with spf 30 which is hard to find! I found it on-line and it's a keeper. Thanks for this review on this particular Biotique product. I ll definitely check the eye cream Rhonda!!! I don't think I ll still be using it as face cream in winters!!! Yes I agree it's good for dry skin! !